Site from the Chilean Centro de Conservación Cetacea (CCC) that's asking kids for opinions on what the blob is. Includes some photos, some aditional facts, and a map. In Spanish. 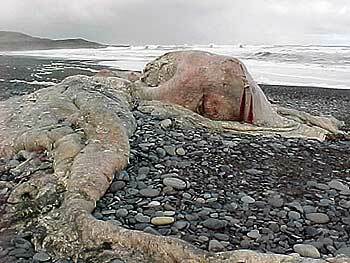 Chilean scientists said on Friday their study of a huge blob of flesh found on a Pacific beach about three weeks ago concluded it was the carcass of a sperm whale, ending speculation of a giant octopus. Is it a sea monster? A new species? Or maybe just the innards of a long dead whale? 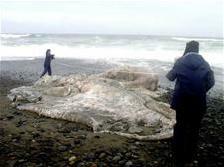 Chileans who found a huge blob of flesh washed up on a remote Pacific beach said on Thursday they would send samples of the specimen to foreign scientists to sort out if it is a rare giant octopus or part of a whale carcass. A huge, gelatinous sea creature found washed up on Chile's coast has stumped scientists, who have sent samples to a specialist in France for help in identifying the mystery specimen. Chilean scientists were baffled today by a huge, gelatinous sea creature found washed up on the southern Pacific coast and were seeking international help identifying the mystery specimen. All headlines, blurbs, and photos are the property of their respective owners and are used without permission for the sake of driving traffic to their sites. Contact lyle at zapatopi dot net if this is a problem. None of the sites linked to are in any way associated with Zapato Productions Intradimensional.